Kiss Air Candles has been around since March 2013 and as a small business it means a lot of people have never heard of us (I know, shocking! But you can read up about us here) and with so many big tried and tested brands in the candle industry, it means some who have heard of us just aren’t willing to take the plunge and buy from a new and different brand as after all, they don’t know what they are going to get with a Kiss Air Candle whereas they know their beloved usual brand inside out. Firstly something we hear a lot is “does it smell when it’s burning?” and the answer is a resounding YES! In fact the reason we started making candles was because we were fed up of spending our hard earned cash on candles that smelt great when directly under your nose but once sat burning over the other side of the room, nothing! So you’ll find all of our products are highly fragranced with a fabulous scent from the top to bottom. Of course, some scents are naturally more subtle and less in your face than others and if your lighting a tea light in order to scent a room the size of Narnia you are more likely to struggle to smell it BUT, the right sized Kiss Air candle in the right sized room is going to engulf you into a world of Kiss Air yumminess as our candles really are candles that smell when burning! We hand make all our candles in small batches using top quality stuff including natural soy wax, cot ton wicks and vegan friendly fragrances to make the most environmentally friendly as possible candles…. and then we test, test, test! Yep you can use all the best ingredients in the world but if they don’t quite work together then the candle is a no-goer here at Kiss Air HQ. For example, did you know that you can wicks in all sorts of thickness? Well you can and if the wick is too fat you are not only going to be left with a good dose of soot up your walls, but the candle is going to burn away too fast for our liking! And what if the wick is too small you say, well you’ll find your candle doesn’t burn all the way to the edge and you are left with the dreaded wax left all around the jar situation! 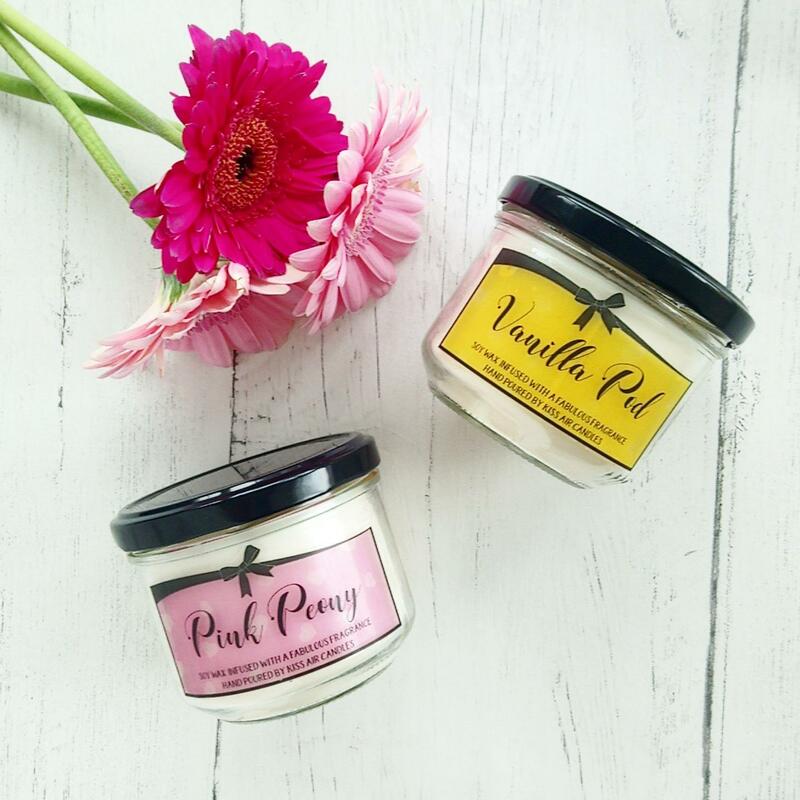 We’ve worked tirelessly to perfect our making, checking and testing procedures to create a range of pretty candles that not only smell amazing but when burned correctly (yes there is an art to burning our candles! Check it out here) they burn cleanly and evenly for hours on end. Lastly, our candles are affordable. There is a misconception that candles with a smaller price tag comprise on quality, and fragrance strength and whilst this may be true for some, it certainly isn’t for Kiss Air Candles for all the reasons mentioned above! At the end of the day, we could easily double our prices to be in line with some of the popular branded candles currently leading the market but personally, we take pride in making sure to give you the very best deal possible for a Kiss Air Candle. * change from a tenner! * Strong fragrance… that can be smelt when burning! Hopefully this slightly long and rambling blog has helped you discover the magic of Kiss Air Candles offers but for anyone who is tempted but still just can’t quite find it in themselves to take the risk, we’ve had many fantastic comments, reviews and love about our products and customer service that we can’t help but share on social media so check us out on Facebook and Instagram and have a look at what other candle lovers say! Until next time, stay scent-sational!